Giving life and zip to…project management software? 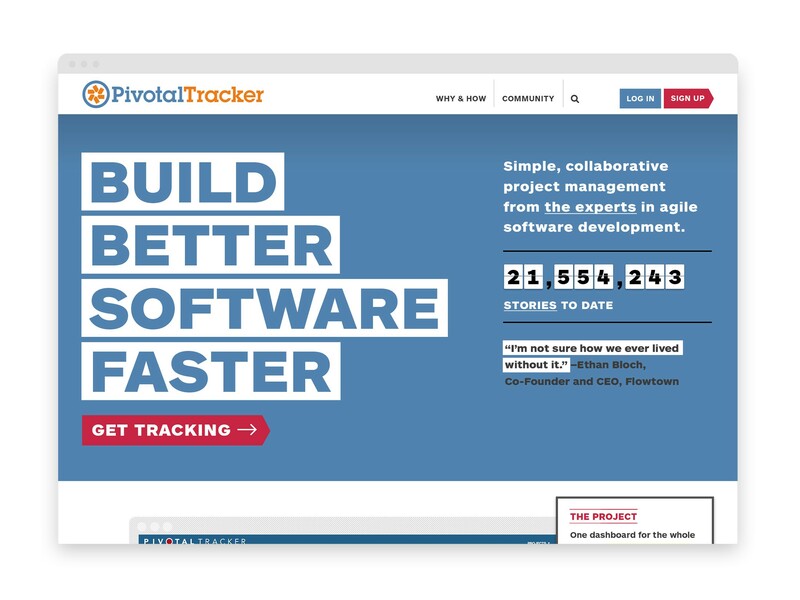 Pivotal Tracker, Pivotal Labs’ signature software product, needed to align its image and messaging as a way to further distinguish the product’s role as the industry leader in project management software. We delivered an identity that is distinctive and authoritative; a website that is usable, direct and informative; and a brand system that makes it easy to add a new product to the Pivotal family. Pivotal Tracker is a digital product that facilitates collaboration, but doesn’t everything these days? Looking deeper, though, revealed a rich backstory. Pivotal Labs and Tracker are the original pioneers of agile development, that developed a better way of working that places people together at the center, with an ethic of clear and transparent communication, in constant motion. More literally, the brand is an visualization of the engine that drives people, the process, and Tracker itself. The brand system makes it easy to add a new product to the Pivotal family.